The following is the Boxing Insider notebook for the week of February 19th to February 26th; covering the comings and goings in the sport of boxing that you might have missed. Tickets for the highly anticipated 12-round unification fight between Canelo Alvarez (50-1-2, 34 KOs), WBC, WBA, Lineal and Ring Magazine Middleweight World Champion, and Daniel “Miracle Man” Jacobs (35-2, 29 KOs), IBF Middleweight World Champion,will go on sale this Wednesday, Feb. 27 at 10:00 a.m. PST. The champion-vs.-champion event will take place Saturday, May 4 at T-Mobile Arena in Las Vegas and will be streamed live exclusively on DAZN. Tickets for Canelo vs. Jacobs are priced at $2,505, $1,505, $1,205, $805, $605, $405, $305, $205 and $105, not including applicable service charges and taxes. There will be a limit of 10 per person at the $2,505, $1,505, $1,205, $805, $605, $405, and $305 price levels with a limit of two (2) per person at the $205 and $105 price levels. To charge by phone with a major credit card, call 888-9-AXS-TIX (888-929-7849). Tickets also will be available for purchase at www.t-mobilearena.com or www.axs.com. To purchase tickets during the pre-sale, subscribe to our newsletter by going on www.goldenboypromotions.com and clicking VIP Connect or by following us on Instagram, Facebook and Twitter at @GoldenBoyBoxing. Tickets for the event, which is promoted by TGB Promotions in association with DiBella Entertainment, are on sale now and can be purchased at ticketmaster.com, barclayscenter.com, or by calling 800-745-3000. Tickets can also be purchased at the American Express Box Office at Barclays Center. Group discounts are available by calling 844-BKLYN-GP. Rungvisai (47-4-1 41KOs) and Estrada (38-3 26KOs) clashed at the LA venue in February 2018 and delivered a memorable all-action affair that saw Rungvisai defeat Estrada by Majority Decision to retain his WBC Super-Flyweight title. Pound for pound Thai star Rungvisai, who recently penned a promotional deal with Matchroom Boxing USA, successfully defended his title for the third time in October on home turf against Iran Diaz, while Mexican ace Estrada enters the bout on the back of wins over Felipe Orucata at The Forum in September and Victor Mendez in Carson, California in December. “I am extremely excited and honored to be back fighting in the US again,” said Rungvisai. “Estrada is a great fighter, and we had an amazing fight last year. Our round 12 was awarded Round of the Year by WBC. That is an evidence of how entertaining the previous fight was. “I believe that this fight on April 26 will be even more entertaining. I am training extremely hard in Thailand. And I am confident I will be the winner on April 26th. The LA man then punctuated his year’s work by stopping Brit challenger Gavin McDonnell in the tenth round of their clash on the first American boxing bill live on DAZN in October, and now looks to make a flying start to 2019 against IBF king Doheny. Doheny’s path has echoes of his opponents as like Roman, the Australian-based Irishman travelled to Japan to land his first World title when he took the strap from Ryosuke Iwasa in Tokyo in August. The unbeaten 32 year old signed a promotional deal with Matchroom Boxing USA in January and swiftly made his first defense in New York against Ryohei Takahashi, stopping the Japanese in the 11th round at the Hulu Theater at Madison Square Garden, with Roman watching in the crowd. “This is the biggest and most important fight of my career,” Roman said. “I haven’t been shy about wanting to unifying the division. This is the fight that I’ve been asking for since I became a World Champion. I need to deliver on my goal of becoming the best and a win against another World Champion puts me in that conversation. “It will be a new experience for me because I’m not fighting a challenger, I’m fighting another belt holder. It’s exciting in a lot of ways. I’ll be at my best because I’m planning to add another title on April 26. “This was my ideal scenario,” said Doheny. “Get the voluntary defence out of the way, then go straight into the unification, so great work from my team, and Eddie Hearn with Matchroom Boxing USA for getting this fight on. It’s unbelievable, it would mean the World to me. It’s just another boxed ticked, after I won the World title, the next goal was to become a unified Champion. I’m looking forward to achieving that. A stacked card in support of the huge World title double-header is led by Jessie Vargas’ move to 154lbs. The Las Vegas-based LA man (28-2-2 10KOs) headlined the aforementioned Chicago show in an entertaining clash with Thomas Dulorme, a draw the outcome after 12 pulsating rounds for the WBC Silver Welterweight title, where a last round knockdown cost Vargas the win. 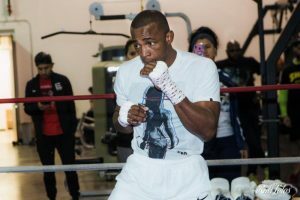 The 29 year old will start the journey on becoming a three-weight World Champion on April 26 and will have a new but familiar face in his corner with the bout marking his first fight under hall of fame trainer Freddie Roach. Roach will be a busy man on the night, with former Super-Bantamweight World Champion Scott Quigg returning to action. The English star (35-2-2 26KOs) returned to winning ways in Boston in October with a spiteful second round stoppage of Mario Briones, and will be on familiar ground in LA where he trains with Roach and shared a bruising fast-paced battle with WBO Featherweight ruler Oscar Valdez last March. “I’m proud to announce this huge card for our first show in LA,” said promoter Eddie Hearn. “Rungvisai vs. Estrada was one of the fights of the year in 2018 and fans can expect another war on April 26 for the WBC and Ring Magazine World titles. “LA’s Danny Roman attempts to unify the division against IBF champ TJ Doheny and two division World Champion Jessie Vargas returns under his new trainer Freddie Roach as he begins his quest to win World titles in three different weight classes. An announcement on ticket details will be made at the launch press conference in LA next Tuesday. Texas prospect Ray “Valentino” Ximenez, Jr. will make his Roy Jones Jr. (RJJ) Boxing Promotions debut this Thursday night, headlining a card live-streamed on UFC FIGHT PASS®, from the Event Center at Legends Casino Hotel in Toppenish, Washington. The 26-year-old Ximenez, fighting out of Dallas, takes on dangerous Luis Alberto “El Venado” Lopez (16-1, 8 KOs), in the 10-round main event for the vacant World Boxing Organization (WBO) International Featherweight Championship. Ximenez vs. Lopez will headline a card to be streamed live on UFC FIGHT PASS, starting at 10 p.m. ET / 7 p.m. PT. The show is the third under a new agreement between RJJ Boxing, and FIGHT PASS, to live stream up to 72 professional boxing events over the next three years. Ximenez (18-1, 4 KOs), who has won his last five fights in a row, was a decorated amateur boxer with a sterling 120-9 career record. A former Texas State featherweight champion, Ximenez won a 10-round unanimous decision in his most recent fight, last June against 111-fight veteran German Meraz. Riding a four-fight win streak, including a 10-round unanimous decision last October over 10-1 Christian Bielma, Lopez will fight outside of his native Mexico for the first time during his 3-1/2-year pro career.